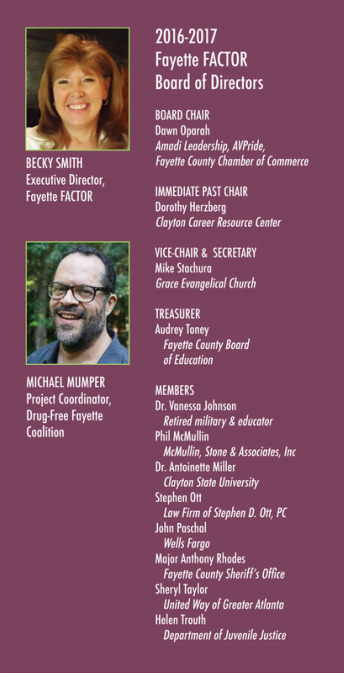 MISSION STATEMENT: The mission of FACTOR is to coordinate resources by bringing all areas of the community together to build a safe, healthy, and drug-free Fayette County through education, networking, and advocacy. The Fayette FACTOR (Fayette Alliance Connecting Together Our Resources) Collaborative is comprised of local business and civic leaders, law enforcement, lawyers and judges, faith-based and school-based organizations, families, ​child advocates, and public and private human services providers. With over 125 members from diverse segments of the community, FACTOR is uniquely qualified to identify needs and coordinate initiatives that help build a stronger community for all of Fayette County. FACTOR collaborative members engage in a planning process to identify community needs and the initiatives and resources required to meet them. The collaborative sets goals and priorities, evaluates strategies and practices, and measures and reports quality of life improvements for Fayette County. Monthly collaborative meetings provide networking opportunities and a platform for organizing advocacy efforts and activities including mentoring, consulting, training, and resource sharing. Under the direction of a volunteer Board of Directors and Becky Smith, Executive Director, FACTOR's current major initiatives include: the Drug-Free Fayette Coalition, Darkness to Light's - Stewards of Children training, SAVE, and the ENCORE! Fayette Leadership Program.